I updated the website a little... made an esthetic fix as well as added those (+X -Y) in the changelog on the right. In case you are not familiar with them, they indicate the number of lines removed or added in the code, and if a line is just changed, it is both removed and added. As is clearly visible, we have not been making any drastic changes to the kernel recently. This is partially because our kernel is so cool that even when we need to change something, we only have to change something like four instructions (I'm kidding of course)... and partially because we've been lazy lately. Well maybe lazy is not the right word, remember even programmers can only work on something as much as life (yes, life... I have one) allows. I've been dedicating a lot of my free time for another project (and getting over being ill) and Kohlrak's been kept bussy with school... although as you can see this didn't actually stop him poking at the kernel for random optimizations. We do in fact, care about keeping this project alive and giving you something interesting to read. Otherwise, everything seems to be working fine and it is time for me to start thinking about a plug-in system for the kernel. That is, most kernels out there detect devices on each boot, which is what the waiting is all about, we have decided against this approach, favoring a much more intelligent approach of only detecting devices while the kernel is being installed. The idea is that eventually, we would create an interactive program to let people pick what they want in the kernel, but for the time being enable support for this by making the kernel in modules that can either be included or simply not. This is already being done, since using this approach you can take the same kernel and pick the boot method by including the right files ("pxe.asm" for PXE, "mbr.asm" for Floppy or "eltorito.asm" for CDROM), as well as all the other components like "mouse.asm", "pcspeaker.asm" and so on. 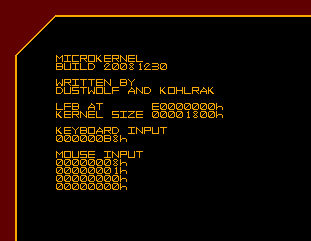 The real challenge however will now be to make the kernel support either PS/2 mouse or Touchpad depending on what file is included. Shouldn't be too hard but I haven't gotten started yet. Working on the kernel is fun so I hope to manage to schedule some more time to work on it.